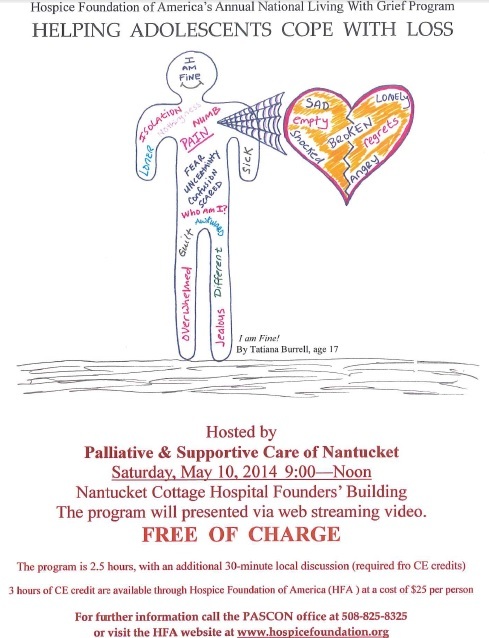 Palliative & Supportive Care of Nantucket (PASCON) is hosting a webinar Saturday, May 10th in the Founder’s Building at Nantucket Cottage Hospital from 9am – noon. The Webinar, titled “Helping Adolescents Cope with Loss”, is part of Hospice Foundation of America’s National Living With Grief Program. Everyone is invited! While the program will be aimed at healthcare professionals and human service providers, the discussion will be appropriate for all and will be offered free of charge. 3 hours of CE credit are available through Hospice Foundation of America (HFA) at $25/person. For additional Information, call PASCON at (508) 825-8325 or email us at pascon@partners.org.